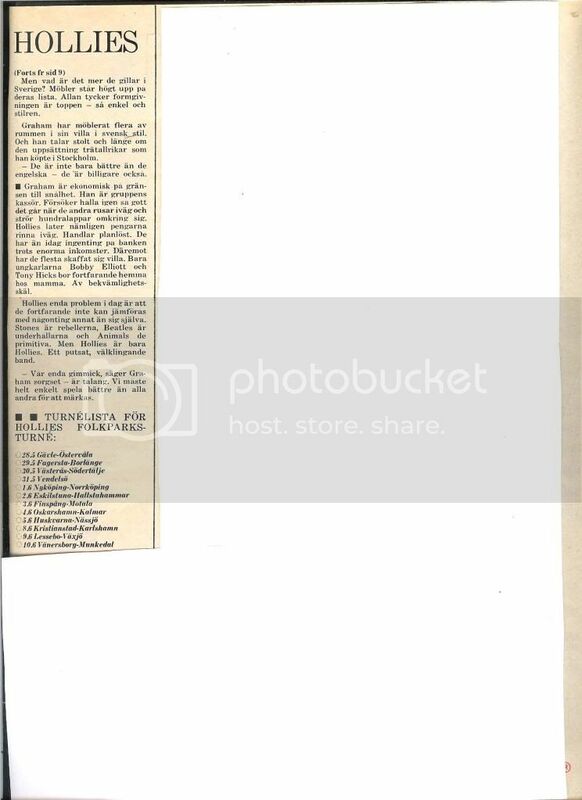 This is an article from Swedish magazine BildJornalen May 1966. I've translated it roughly. Not very deep perhaps, but many kind words about Sweden. Soon the Hollies will be landing on Arlanda (Stockholm) again. The singer Allan Clarke will be overjoyed to once again embrace a "dala-horse". Allan has been sad because he lost the wooden horse he got on his first visit to Sweden. Now he's got the chance to get a new one. He speaks so often about the dala-horse that it's easy to get the impression that he goes to Sweden only to get a new wooden horse. The other members of the Hollies are coming here to tour the Swedish folk parks with the Lee Kings. They look forward to their visit for many reasons. They think that the best audiences are to be found here. And, of course, it's not everyday the Hollies get the pleasure to play the crown off Herman and his Hermits. That's what they did at a show in Stockholm before Christmas. It was the Hollies who got the biggest applause. But the Hollies also dream of meeting long legged slender blonds. - But we didn't see one single blond last time says Graham with disappointment. I believe it was because it was winter and all the gorgeous women were muffled up or perhaps they were sitting at home by the fire. But when we come this time it will be summer. Surely, that will be different?? - And last time we only stayed a few days in Sweden. We didn't get much chance to see anything but the hotel rooms and the taxis and they look the same all over the world. This time we are going to tour Sweden for fourteen days. What made the deepest impression on the group, apart from the lack of blonds, was the club called the Salt lake. - A boat that functions as a club for celebrities, at Strandvägskajen in Stockholm. 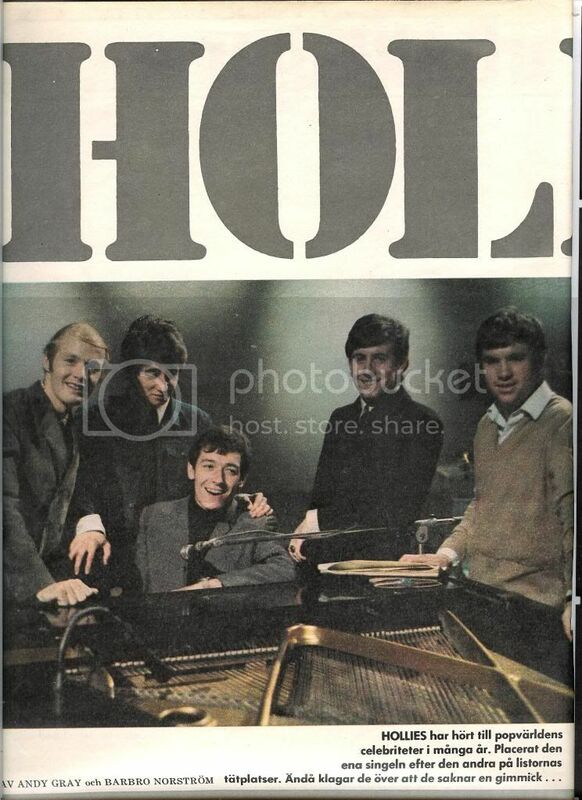 The Hollies really rocked the boat. On the Salt lake there's an organ, a bass and a couple of drums. The Englishmen jumped down behind the instruments and started jamming so that the ties started fluttering. Some of the Hermits who also had ventured to visit the club shrunk embarrassed down into their suits. The longer the Hollies jammed the more the Hermits shrunk. After about an hour, they went home to their hotel rooms. But the Hollies kept on rocking. They did their latest hits to an audience of celebrities - actors, singers, radio/TV-people and so on. - It was a great club, Graham says. We met lots of famous people. They were very nice all of them and not a bit snobbish. That, by the way, is the best thing about Sweden - everybody is natural and kind. The drummer Bobby Elliott, the man with the many and brightly coloured sport shirts, also wants to have a word. - Sweden is my place. I really long to get back there. Your audiences are great. Here in England you know that the audience hardly can hear a thing because of all the noise. In Sweden it's different. Everybody is dead quiet while you play, and after you stopped, then comes the applauses and the screams. 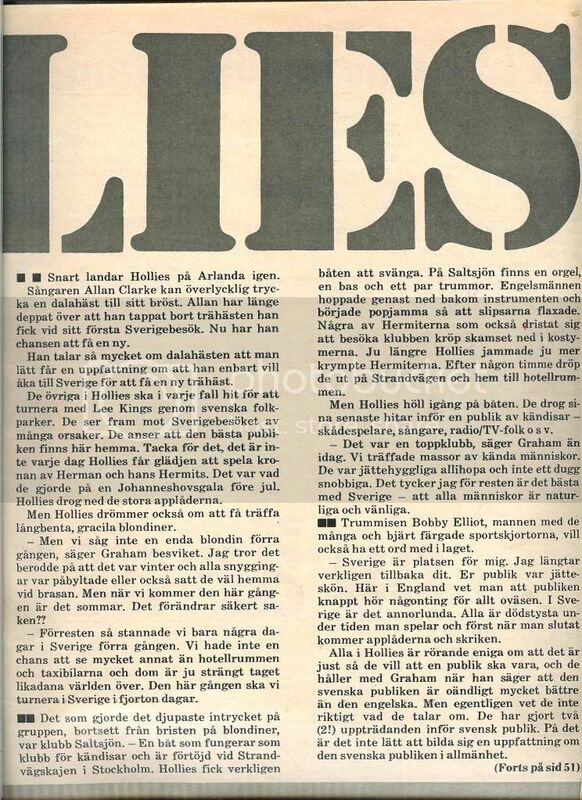 All of the Hollies agree that that's just the way they want an audience to be, and they agree with Graham when he says that the Swedish audiences are so much better than the English ones. But they really don't quite know what they're talking about. They have only done two (2!) shows before a Swedish audience, and it's hard to form an opinion after so few shows. But what else do they like about Sweden? Well, furniture is high on their list. Allan really loves the Swedish design - so simple and pure. Graham has furnished some of the rooms in his house in Swedish style. And he speaks proudly of his set of wooden plates that he bought in Stockholm. - They are not only better than the English ones - they are cheaper too. Graham is economical, on the verge of being cheap. He is the cashier of the group. He tries to hold back when the others rushes off and splash their money about. For the Hollies let their money flow away. They shop aimlessly. They have nothing in the bank in spite of their enormous incomes. But many of them have got themselves houses. Only the bachelors Bobby Elliott and Tony Hicks still lives at home with mum. For convenient reasons. The only problem for the Hollies today, is that they still can't be compared to anything other than themselves. The Stones are the rebels, the Beatles are the entertainers and Animals are the primitive ones. But the Hollies are just the Hollies. A nice harmonious band. - Our only gimmick, says Graham heavy-heartedly - is talent. We simply must play better than all the rest to be noticed. Thanks for this, Agneta. The guys are so funny and down-to-earth. I also like Swedish furniture. We have Ikeas all over the place here. The photo is so adorable. This sounds like a great plug for Sweden. Judging by what the Hollies have to say about it, it's no wonder they went back there so often.